Seems quite fitting I’ve been chosen for the runner profile on April Fools day, thanks David. 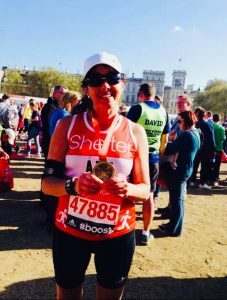 How did I get into running? I’m amazed at every run I complete as I sincerely hated , and I mean hated running through my infancy & youth. I spent a large part of my infancy wearing orthopaedic boots due to feet & ankles problems in Gran Canaria where I was born & raised, which was extra horrible due to the hot climate. I was always tripping over my own feet & still manage to when I run tired. At school, my sports were swimming & ballet which I enjoyed very much. I won most swimming races I took part in. When I arrived in the UK at 15 years of age, school had no sport to offer that interested me so PE lessons were spent at home after registration with my B & H, it was super-easy to skive school here. I did no sport whilst my boys were growing up, I was too busy enjoying myself in their company or tending to their taxi needs. Once mum services were no longer required I was bored & started gaining weight, so joined the local gym & participated in every fitness lesson available. I couldn’t shift the last half stone & after speaking to a PT she just told me to RUN! Eeeekkkk. I won’t go into all my embarrassing first attempts at running by myself, the first one being to the end of my road before I headed back much to everyone’s amusement in my household! So, I exchanged Spanish lessons with running sessions with the gym PT & saw results with weight loss which got me hooked as I didn’t have to spend hours & hours at lessons which had become very repetitive. 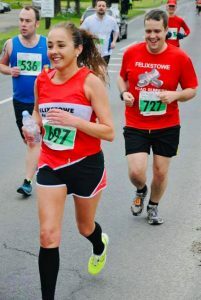 Once I got into the running I wanted a challenge, so applied for a charity place at the London Marathon & this is how I ended up at Felixstowe Road Runners. All of them! 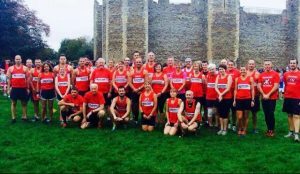 I take a memory from each race, my first race was a charity 5K race at Martlesham, I remember being really scared & nervous & thinking a race official would pull me out for not being a runner, I was really pleased to finish. I remember standing next to who I now know is Phil Nuttley, one of my favourite people in the running word & thinking “at least I won’t be last”. He beat me by a large number of minutes. I learned a lot that day. 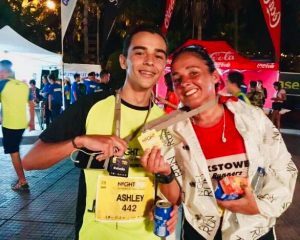 My favourite running moment was a night time half marathon which takes place in G Canaria every October, it’s great as I am an evening runner. I was running towards an underground passage/tunnel in the race with a steep downhill followed by a steep uphill. As I approached it “the ace of spades” started playing on my playlist & as you go uphill coming out of the tunnel there is a massive crowd cheering you on over the railings at the uphill, it’s the fastest I’ve run up a hill, loved it. My two hometown races, Richard Bennett Coastal 10, Gran Canaria Nightrun & I am going to have to sneak Twiglet in there too. 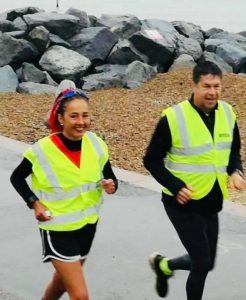 My running took a bit of a dip the last two years for various reasons, the worse one being diagnosed with an under-active thyroid which had a negative effect in my life, including my fitness & well-being. I’ve learned to cope with it now so all good, I am back to running regularly & really appreciate it now. I like the running world in my future, it’s a special place with many benefits which has also created many friends & great characters who I much enjoy being in my life. 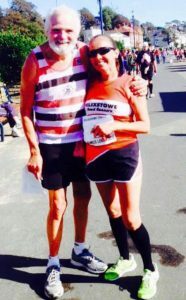 She’s going to kill me for this, I am nominating one of my running heroes & long time friend, it took me almost two years to get her to join our distinguished club, she was adamant she did not want to be affiliated to any club or wear any club vest & now she rocks it at every race. Vamos Zoila Reyes.